Sarah “Sally” Buxkemper’s passion for agriculture was evident in her work in refining cattle pedigrees. Working in a male-dominated field, Buxkemper’s career was anything but mediocre. She aided in the development of a new breed of cattle, the Simbrah, combining Simmental with Brahman, which is resistant to the ailments of its ancestors. She was one of the few women (preceded by Honoree Minnie Lou Bradley) to graduate with an Animal Husbandry degree from Oklahoma State University, and was the first woman to be trained by the American Breeders Service to administer artificial insemination. 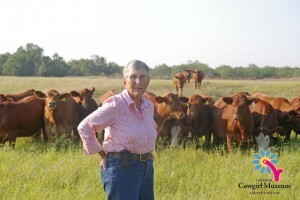 Buxkemper lived in Ballinger, Texas where she maintained the RX Ranch, managing cattle and continually working to improve her herd and sell product world-wide.